HIV/AIDS has been a part of public consciousness for about as long as I’ve been on the planet. Because of this, I was a small child during much of the first decade of chaos and confusion; I was mainly unaware of the mounting deaths and lack of solutions. Instead, my reality of HIV/AIDS has been yes, one of death and devastation, but also one of progress and promise. I have seen the developments of a greater scientific understanding of the virus, continued progress towards more comprehensive and effective testing and treatment, and hints at the real possibility of an AIDS free generation. In Lesotho, no one is unaffected by HIV/AIDS. With a 1 in 4 infection rate, it is unfortunately a country partially defined by this epidemic. During my time in Lesotho I’ve been excited to see all the advancements towards fighting HIV/AIDS. Antiretroviral therapy(ARVs) for adults and children are available at even the most isolated rural clinics. Mother-Baby packs are provided to all pregnant women as part of a comprehensive program to fight against vertical transmission. Basotho communities express an improved understanding and acceptance of HIV/AIDS, acknowledging that it need not be a death sentence. And at the same time I have been continually frustrated and saddened that red tape, a lack of resources, and waning political commitment mean that solutions we know to be successful at fighting HIV/AIDS are not being implemented effectively in Lesotho, and particularly Mokhotlong. Clinics run out of ARVs meaning a grandmother may waste four hours walking to and from a clinic, failing to get what she has been taught are critical medications for her child. HIV+ women still give birth at home because of a lack of other options, despite the known dangers this presents for both mother and baby. Blood samples to test a child for HIV or assess the stage of the virus in their small bodies – two critical steps in getting started on treatment – are lost or results never make it back to the clinic, causing unnecessary, life threatening delays. In the news coverage leading up to World AIDS Day, the hope and deflation expressed in this article feels like a perfect reflection of what it’s like working in the field of HIV/AIDS in a resource poor setting. Despite all we know about the virus and everything we can do to prevent its disastrous effects, if it’s not making an impact in the locations where the epidemic is at its worst, it’s simply not enough. This week TTL lost one of the children being cared for in the safe-home. After three days admitted at hospital for distressed breathing, this little girl passed away. She had been identified as HIV+ in October but confirmatory results from a second test had still not come back so she was not on treatment. It is suspected she contracted a form of pneumonia that targets children with low CD4 counts (a sign of a greatly weakened immune system and the need to start ARVs). Suspected because the hospital does not have the human resources or equipment to say for certain. Despite severe malnourishment and repeated prescriptions for antibiotics it took two visits in one day to convince the hospital they needed to admit her. Unfortunately, adequate medical attention came too late for her small, weakened body. In my mind, this little girl’s death – like so many children’s deaths in Lesotho – was not due to negligence but a lack of resources. There are simply not enough trained medical staff, equipment, and treatment options to handle the burden an epidemic like HIV/AIDS places on a health system. My wish for last year’s World AIDS Day was for an HIV+ child that TTL supports to continue to grow and thrive. I'm happy to say that one year later, she is doing exactly that. My wish for this year is a bit bigger and of the same importance. It's a wish for true global commitment to produce real results that will end this epidemic. Commitment that reaches up from the grassroots where it is so strong to the highest political offices, ensuring that an AIDS free generation is possible both in rhetoric and on the ground where it counts the most. 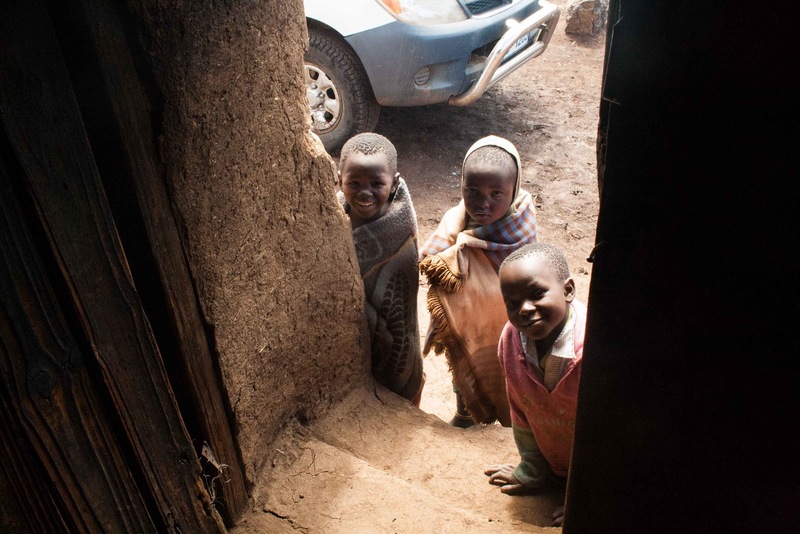 Children outside a rondavel belonging to a family currently supported by TTL's Outreach Program.